New York, NY (March 20, 2018) – The Film Society of Lincoln Center and Comeback Company announce The Puppet Master: The Complete Jiri Trnka, the first complete U.S. retrospective of the works of Czech animation master Jiri Trnka (1912-1969), April 20-25. Trnka’s body of work as a director—18 short and six feature-length animated films in total—was rivaled only by Walt Disney Studios in output and brought him international acclaim, from Cannes to Venice and beyond. With his puppet animation studio, founded in 1946, he helped lay the groundwork for Czech animation predominance alongside stop-motion animation masters Karel Zeman, Hermina Tyrlova, Jan Svankmajer, and Jiri Barta. This essential series will present all 24 of the artist’s films, including 11 newly translated works and the U.S. premieres of two new digital restorations: Trnka’s Venice Film Festival prize-winning first feature The Czech Year and Old Czech Legends, a breathtaking collection of Bohemian myths. The lineup also features Trnka’s Shakespeare adaptation A Midsummer Night’s Dream, narrated by Richard Burton; his subversive, absurdist, anti-authoritarian trilogy The Good Soldier Svejk; and three distinct shorts programs featuring the filmmaker’s unique early work in hand-drawn cartoons (including Cannes Film Festival prize-winning The Animals and the Brigands), his magical family-friendly works, and his later, more formally and politically defiant films (featuring his final masterpiece, The Hand, about the plight of artists toiling under the restrictions of a totalitarian government). Also included is a two-program sidebar dedicated to Jiri Brdecka, a screenwriter and animation director whose close friendship with Trnka occasioned a number of short- and feature-film collaborations. After originating at the Film Society in April, the series will continue on in variations to tour North America. Trnka’s films will screen at the American Cinematheque (Los Angeles, CA), George Eastman Museum (Rochester, NY), Cleveland Cinematheque/CIA (Cleveland, OH), Harvard Film Archive (Cambridge, MA), Lightbox Film Center (Philadelphia, PA), The Gene Siskel Film Center (Chicago, IL), The Cinematheque (Vancouver, BC, Canada), Cornell Cinema (Ithaca, NY), Speed Art Museum (Louisville, KY), and more to be announced. The touring retrospective is produced by Comeback Company, with support from the Czech Film Fund. Organized by Irena Kovarova with Florence Almozini and Tyler Wilson. Films provided by the Czech National Film Archive. Tickets go on sale April 6 and are $15; $12 for students, seniors (62+); $8 for kids under 12; and $10 for Film Society members. See more and save with the 3+ film discount package or All-Access Pass. Learn more at filmlinc.org. Acknowledgments:Alex Zucker; Martina Raclavska; Marketa Santrochova, Czech Film Center; Michal Bregant, Katerina Fojtova, Tomas Zurek, Michaela Mertova, Czech National Film Archive. Special thanks to the Czech Center New York. Trnka’s adaptation of a classic Hans Christian Andersen fairy tale is an enchanting animated jewel box. Framed by live-action sequences—about a lonely boy shut away from fun and play—the story unfolds as a child’s dream vision, a tale of illusion versus reality in which a Chinese emperor is ensorcelled first by the song of a nightingale, then by its mechanical replica. Working in a rich red, green, and gold visual palette, Trnka conjures a hallucinatory storybook world of moonlit bamboo forests, softly glowing Chinese lanterns, and bursting fireworks displays all set to a gorgeous, rhapsodic score by his key collaborator, Vaclav Trojan. Based on a pair of Czech fables, this rousing, medieval-set adventure charts the exploits of a young peasant whose dead mother returns in the form of a white horse, whisking him away on a quest to free her soul from purgatory and save three princesses from a host of hydra-headed dragons. Balancing moments of atmospheric lyricism with vigorous action sequences, the third feature-length collaboration between Trnka and composer Vaclav Trojan—who contributes a stirring, cantata-like score set to text by Surrealist writer Vitezslav Nezval—confirms the pair to be a creative partnership as fruitful as Eisenstein and Prokofiev or Hitchcock and Herrmann. A treasure trove of Bohemian myths are brought to life by Trnka’s magical puppet work in this folkloric hymn to the Czech land, history, and people newly restored by Czech National Film Archive. Based on a tome by the “Czech Sir Walter Scott” Alois Jirasek and the medieval chronicle of Cosmas, it illustrates seven fabled historical episodes, including the settling of an Edenic ancient Bohemia, the tale of an all-female revolt led by a cast-out princess, and the legend of a weak-willed king whose passion for gold nearly destroys his kingdom. It all culminates in a breathtaking climactic battle sequence—a tour de force of editing, music, and stop-motion (employing more than 70 figurines) that plays like puppet Kurosawa. U.S. Premiere of the new digital restoration. The Good Soldier Svejk, Parts I-III / Osudy dobreho vojaka Svejka I.-III. Two mischievous frost spirits—voiced by famed comedian Vlasta Burian and author, popular actor, and satirist Jan Werich—make things chilly for a pair of travelers in this wintry comic folktale. A Midsummer Night’s Dream / Sen noci svatojanske Jiri Trnka, Czechoslovakia, 1959, 35mm, 72m English version Richard Burton narrates this bewitching adaptation of Shakespeare’s romantic fairy tale, in which the love lives of mortals and forest sprites mingle during one magical moonlit evening. In his final feature—also the first CinemaScope film made in Czechoslovakia—Trnka deploys the full force of his imagination and technical wizardry to evoke the story’s enchanted-woodlands setting, a garlanded, pastel dreamscape awash in starry-night atmosphere, colorful festoons of flowers, and exquisitely wrought fantasy creatures. The graceful puppetry combined with the Vaclav Trojan score and voiceover work by Burton and members of the Royal Shakespeare Company yields a masterpiece of surpassing, balletic beauty. Why UNESCO? / Proc UNESCO? Commissioned by the United Nations Educational, Scientific and Cultural Organization (which considered Disney for the assignment before settling on Trnka), this cartoon short employs strikingly simple animation to make the case that all of humanity is enriched when we tear down the walls that separate us. Saturday, April 21, 7:30pm (Q&A with Tereza Brdeckova, film writer and daughter of Jiri Brdecka) *Pre-screening reception open to all ticket holders, with beer courtesy of the Czech Center New York. Trnka proved himself to be a master animator from the very beginning, as evidenced by the formally inventive, wittily offbeat works in this program, which includes the filmmaker’s earliest experiments in the art form: hand-drawn cartoons that play like a distinctly Czech anti-Disney, a modernist tour de force of surrealist invention, and a rapturously beautiful puppet adaptation of Chekhov. A farmer finds himself with an unusually fertile bumper crop on his hands in Trnka’s first film, a charming hand-drawn adaptation of a Czech fairy tale that announced the director as an animation talent to rival Disney. The program also serves as a survey of animation techniques employed by the artist throughout his career. Trnka combines 2-D and collage animation to striking effect in this zanily offbeat, anti-Nazi lampoon, which crosses Max Fleischer–like absurdism with a biting satirical edge. His first collaboration with Jiri Brdecka. Trnka reached new heights of modernist abstraction with this innovative, surrealist mini-masterwork, which critic Jean-Pierre Coursodon praised as the Citizen Kane of animation. 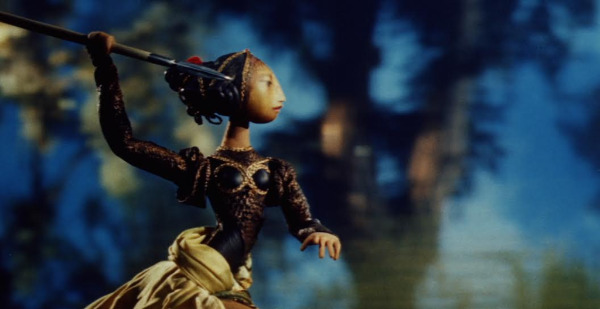 Czech with English subtitles This dreamily beautiful puppet work adapts a short story by Chekhov into a magical, moonlit reverie about a musician, a princess, and a chance encounter while night-swimming. Silly circuses, classic fairy tales, and toy trains come to life through magical stop-motion, puppet, and hand-drawn animation in these charming, family-friendly shorts that showcase Trnka’s fruitful collaborations with fellow artists, animators, and puppeteers. No dialogueTrnka brings to life a surrealist circus of tightrope-walking fish, musical monkeys, balancing bears, and high-flying acrobatics in this whimsical feat of cutout animation made in collaboration with leading Czech painters of the era. The Czech version of Hansel and Gretel receives a captivating, puppet-animated adaptation, featuring striking—and fittingly macabre—storybook imagery designed by Trnka and direction by his close colleague and animation heir, Bretislav Pojar. Folk art–like hand-drawn stills illustrate this sweetly simple pastoral fable, in which a peasant comes into possession of a small fortune—but realizes there are treasures greater than gold. How do you wake up a sleeping puppet? Made by Trnka in collaboration with actor and puppeteer Josef Pehr, this winsome mix of live action and puppet play is enchanting entertainment for the youngest of viewers. An old woodblock train meets its shiny new electric replacement one Christmas Eve in this glowingly nostalgic stop-motion toy story, directed by Bretislav Pojar and featuring gorgeous design by Trnka. Circus Hurvinek / Cirkus Hurvinek Jiri Trnka & Stanislav Latal, Czechoslovakia, 1955, 23m Czech with English subtitles Trnka pays homage to two of Czechoslovakia’s most beloved characters—Spejbl and the mischievous Hurvinek, a father and son duo created by Trnka’s puppeteer mentor, Josef Skupa—in this imaginative tale of a young boy who dreams of being part of the circus. In the 1960s, at the height of his artistic powers, Trnka turned to increasingly dark, surreal, satirical, and politically defiant subject matter. The result was a string of visually innovative, modernist masterpieces that encompass dystopian science fiction, religious parody, and, in his final crowning achievement, an impassioned protest against state censorship. A boy’s need for speed causes problems throughout his life in this triumph of modernist design, which blends puppet, stop-motion, collage, and cutout animation with a gothic humor and Pop Art–like visual design. Trnka took a turn into Space Age sci-fi surrealism with this dark, dystopian satire on automatization in which a child traverses a forbidding technological wasteland to meet (surprise!) her uncanny new robotic grandmother. No dialogueAdapted from a story in Boccaccio’s Decameron, this irreverent, medieval-set lampoon of religious hypocrisy mixes Christian iconography with bawdy black humor to tell the tale of a lusty Venetian monk who assumes the guise of the angel Gabriel to seduce a married woman. No dialogueTrnka’s final work is a powerful, deeply personal allegory about the plight of the artist toiling under the restrictions of a totalitarian government. The story of a simple sculptor who is menaced by a giant, disembodied hand that forces him to bend to its will, it was banned by the Communist censors for two decades—but has since taken its place as an acknowledged masterpiece of animation. Tribute to Jiri Brdecka Along with Trnka, Jiri Brdecka (1917-1982) was one of the founders of Czech animation, who explored its potential as a serious art form as early as the 1940s. Even though he’s best-remembered and revered abroad for his short animated works as a director, Brdecka wrote many screenplays for others’ films, both animated and live action, including the remarkable and immensely popular Western parody Lemonade Joe (1964), based on his eponymous novel. He penned original ideas, scripts, and dialogues for renowned directors such as Martin Fric (The Emperor’s Baker – The Baker’s Emperor), Oldrich Lipsky, Jiri Weiss, Karel Zeman (The Fabulous Baron Munchausen), Vojtech Jasny (Cassandra Cat), and Vera Chytilova (The Very Late Afternoon of a Faun, based on his book of the same name). But his longest-lasting collaboration was with Jiri Trnka, having co-written four of Trnka’s animated shorts and three of his feature-length puppet animated films. This program is a companion to the complete Trnka retrospective, held in homage to their creative partnership and close friendship. Program organized by Limonadovy Joe s.r.o. in partnership with Czech Centres. Films courtesy of the Czech National Film Archive, Kratky Film Praha a.s., and Rembrandt Films. Thanks to Irena Kovarova/Comeback Company. Czech with English subtitlesThis relentless and hilarious musical send-up of the American Western written by Brdecka is one of the most popular works in Czech film history. Lemonade Joe follows a soft drink–swigging gunfighter as he tries to steer the sinful residents of Arizona’s Stetson City away from alcohol and toward the health benefits offered in Kolaloka (a parody of Coca-Cola). The satire was adapted from versions of the character created by Brdecka across various media, including print, radio, and the theater. The visual gags are reminiscent both of the 1920s American silent slapstick and the colorful era of the swinging ’60s, including its inspired music and songs (the full title in Czech calls it a Horse Opera). Based on the same source, Jiri Trnka made the short puppet film Song of the Prairie (1949), showing in his retrospective with the feature Bayaya. Prince Copperslick / Trinacta komnata prince MedenceJiri Brdecka, Czechoslovakia, 1980, 9mCzech with English subtitlesSaturday, April 21, 4:30pm (Introduction by Tereza Brdeckova, film writer and daughter of Jiri Brdecka) *Post-screening reception open to all ticket holders, with beer courtesy of the Czech Center New York. Special Thanks to NYLO NYC. Based in New York, Comeback Company was founded by producer and independent film programmer Irena Kovarova. Having worked in repertory cinema since 2004, Irena founded the company in 2013 to further expand her film projects. Among major programs produced by the company are a retrospective of Czech director Jan Nemec’s 50 year career (in 2014), and a touring retrospective of Academy Award nominated director Ruben Ostlund (in 2014-15), which both toured over 15 cities in North America and screened in New York City. Another program was a retrospective of Kelly Reichardt films touring through 5 countries in Central Europe in 2016; For details, visit www.comebackcompany.com.